Scott Walker and the Republicans were ever so proud of being able to claim a budget surplus of a few million dollars which was really more of a matter of lowered expectations than a true surplus. The state of Minnesota’s budget office on Thursday morning reported a $1.871 billion budget surplus. State law requires that $594 million of the surplus go into a reserve fund, and another $71 million into the environmental fund. That means, lawmakers will have an extra $1.2 billion to either spend or give back when they open the legislative session in March. Government spending is down and state revenues are up -- mostly driven by higher collections of sales taxes and corporate franchise taxes. Keep in mind that Minnesota increased their minimum wage - even for food servers - so that people have more money in their pockets and, golly gee, they spent it and improved their economy. Scott Walker said he doesn't think that the minimum wage serves a purpose. Minnesota also makes corporations pay their fair share of taxes as opposed to Walker who gives companies and wealthy campaign donors such big tax breaks that they don't even pay taxes, leaving it to ordinary taxpayers to pay their share as well as the companies. 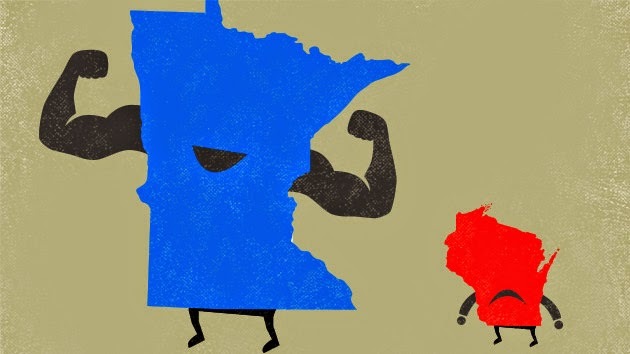 Is it any wonder that Minnesota Republicans are clamoring to kill their economy. If people caught on to who will help them more, Republicans might never get elected again, despite all of the Kochs' money supporting them. It also just might explain why people are fleeing Wisconsin in droves for greener pastures, such as those in Minnesota. But hey, at least we have the Paul Bunyan Axe...or at least we will until Walker and the Republicans get done destroying the UW system and we are no longer able to attract good players, coaches, teachers, etc. Why does the MN DFL Party hate the poor. You missed this one, jeffy.Just out last week. And thất gặp grew by more than $2,000 in the last 5 years. Maybe in your world, paying a handful less in taxes is preferable to taking home higher wages, but it sure doesn't work for us that live outside of Momma's basement. Why does the GOP hate everyone not white and male?